This article introduces the rationale and techniques involved with MIMO (Multiple-Input, Multiple Output) based communication systems. The communication impairments due to multipath channels are discussed in order to provide the base motivation for the application of the MIMO technique and in particular, the use of OFDM (Orthogonal Frequency Division Multiplexing) and spatial multiplexing for equalizing broadband wireless channels with non-selective fading. The presence of multiple reflections and multiple communication paths between two radio terminals cause signal fading impairments to a wireless communication link. There is both selective and non-selective fading. Non-selective fading is the case where the frequency components over the signal bandwidth are dynamically attenuated by the same amount and do not create any signal distortion, but only temporal signal loss. Selective fading is the case where smaller frequency segments of the signal’s spectrum are attenuated relative to the other remaining frequency segments. When this occurs, the signal spectrum is distorted and this in turn creates a communication impairment that is independent of signal level. 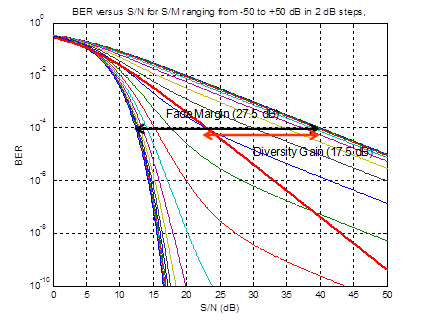 For the case of narrow band signals with non-selective fading, the communication impairment can be countered by providing more signal level margin in the communication link or using selection diversity techniques to select the best antenna input based on the relative signal strength. However, in the case on non-selective fading, the signal must be equalized to restore the signal fidelity and expected communication performance. This fading is produced by the arrival of multiple replicas of the transmitted signal at the receiving antenna. The signal replicas are produced by multiple random reflections within the communication medium, such as an indoor communication channel. 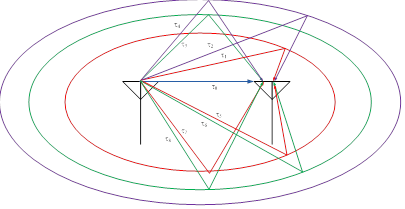 The multipath concept is shown below in Figure 1 for reference and is based on the notion of an ellipsoidal fading model . Figure 1: Multipath Channel Model Illustration. If one constructs a simple two-ray fading model and is able to generate the signal attenuation versus communication range, one finds the presence of crests and nulls due to the constructive and destructive interference caused by the arrival of the signals at different delay times and therefore, difference phase angles. In some cases the phase angle can be at or near 180 degrees and can cause partial signal cancelation, or conversely in the case of signals that are in-phase, partial signal enhancement. The attenuation profile for a two-ray fading model is shown in Figure 2 for reference. Note the periodic signal nulls as the communication range changes. The period of the null spacing is one-half wavelength. Figure 2: Multipath Effects on Attenuation versus Communication Range for a two-ray model. As mentioned previously, the effects of this localized and sudden attenuation can compensated by receiving the signal at two different receiver antenna placement locations and selecting the best antenna based on the signal strength or some other receiver performance measure. The diagram Figure 3 illustrates this situation by showing the signal strength at two different antenna placements over communication range and/or time. The point of the illustration is that the signal strengths associated with the antennas are generally not correlated in time and/or space and when one signal is in a null, the other can be found near a maximum and selected for communication. Figure 3: Relative Signal Strength for two receive antenna locations within a multipath channel. The selection of one antenna over the other based on signal quality, or Selection Diversity is technique that works well for non-selective fading in that the antenna selection essentially is a signal-strength restoration technique. The effects of antenna diversity for a Rayleigh fading channel are presented below in Figure 4 showing a 17.5 dB gain in performance. Note that the same performance can be achieved by introducing additional signal level margin of 27.5 dB without the additional antenna and selection scheme. Figure 4: Bit Error Ratio Curves for Rician Channels for various Specular (Line of Site) power relative to the sum of all of the Multipath components, or S/M ratio. Note effect of antenna selection diversity on Rayleigh Channel, the worst case Rician Channel with a S/M approaching zero (-50 dB). However, for broader band signals more commonly used in modern wireless systems such as Wireless LAN, selection diversity and other signal strength restoration techniques are not enough to equalize the impairments imposed by the multipath channel due to selective fading. Figure 5: Construct of Selective Fading Complex Channel Impulse Response (dot stems=real, asterisk stems = imaginary) and Complex Low-Pass Transfer Function (magnitude and phase). Ideally, the channel transfer function only adds a flat fading process (constant attenuation versus frequency) and a single fixed time delay (linear phase). However, the case shown above creates a transfer function for the signal that provides asymmetric and frequency dependent fading of amplitude as well as a non-linear phase response, assuming that significant sidebands of the signal are distributed across the entire transfer function shown. If the sidebands of a complex modulated signal where distributed across the transfer function shown, there would be significant signal distortion and modulation conversion (AM to PM and AM to PM). 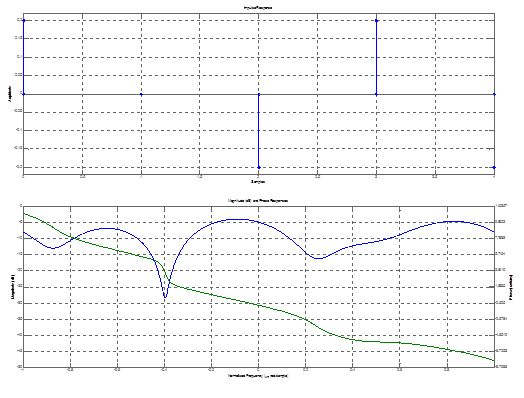 This again, is the effect of a multi-path channel with a coherence bandwidth that is less than the signal bandwidth. In order to compensate for these effects, the transfer function encountered via the communication channel must be equalized at the receiver. Ideally if the inverse of the transfer function could be applied to signal prior to detection to flatten the amplitude response and to linearize the phase, the signal impairments would be eliminated. There are several different types of transversal equalizers that operate on the time domain representation of the baseband signal to achieve the equalization; however, many rely on training sequences and training periods (receipt of non-information bearing training information that creates communication overhead). The introduction of Orthogonal Frequency Division Multiplex (OFDM) signaling not only provided a means of spectrally efficient communications, but also provided for a means of channel equalization in the frequency domain. Shown in Figure 6 is a diagram of an OFDM spectrum, showing 48 data subcarriers and 4 pilot subcarriers. The pilot subcarriers are not information bearing but are used to help maintain the carrier and timing tracking in low-signal to noise ratios since they are always BPSK modulated. 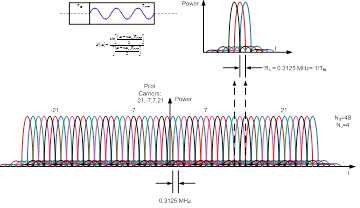 OFDM essentially provides a means of sampling the magnitude and phase of the channel at any or all of the subcarrier frequencies, since the carrier phase tracked at the receiver and all of the subcarrier phases are coherent to the main carrier. However, in practice, performing continuous subcarrier phase tracking on each of the subcarrier is not executed, rather, short and long training symbols with known patterns are transmitted with each packet such that the receiver can determine the channel transfer function, invert it, and then apply the inverse to the received spectrum in order to equalize the channel on a packet by packet basis. Figure 6: Construct of entire OFDM spectrum, 3 isolated subcarriers, Subcarrier Spectrum that arises from amplitude masking by FFT interval and Guard Interval. Figure 7 shown below illustrates how the channel transfer function due to selective fading weights the received spectrum. At the receiver, the magnitude and phase of each of the subcarriers provide an estimate of the channel transfer function, Hc(). An equalization transfer function, He(), can be applied to the channel-weighted spectrum to re-normalize the spectrum such that the effects of the channel can be reduced or eliminated. 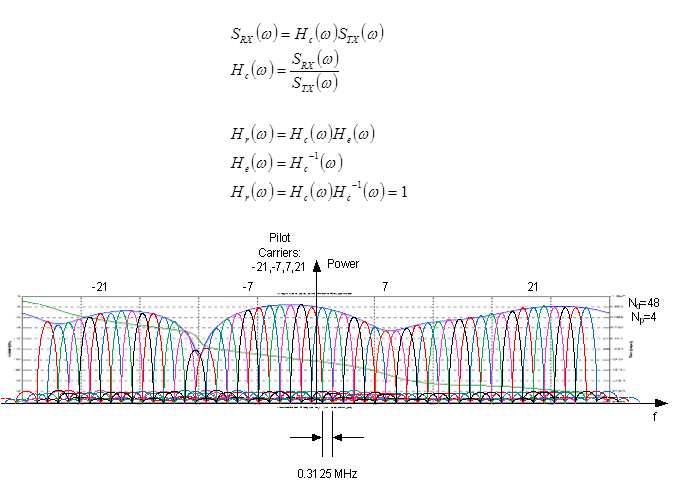 Figure 7: Channel Transfer function effect on OFDM spectrum. Each subcarrier has its magnitude and phase altered, but can sensed and used to generate an equalization filter transfer function. In the previous sections, multipath channels, non-selective fading, selective fading and OFDM signaling were discussed. Further, it was shown that antenna selection diversity is a technique for improving the performance in a non-selective fading channel and OFDM provides for channel equalization against frequency selective fading. In this section, the MIMO technique is discussed and essentially brings two elements together: OFDM and antenna diversity. In general there are different permutations of redundant transmitters and receivers to improve the robustness of a communication link and the information carrying capacity of the link. Shown below in Figure 8 are the different, general redundancy configurations, SISO, SIMO, MISO, and MIMO. SISO or Single-Input, Single-Output systems do not provide any type of robustness or capacity improvement and represent a basic wireless communication link. SIMO or Single-Input, Multiple-Output systems are configurations that provide receive-side diversity and provide additional robustness, but no capacity improvement. Examples of SIMO systems are receivers with selection diversity schemes or Linear Maximal Ratio Combining (LMRC) schemes . MISO or Multiple-Input, Single-Output provides transmitter diversity in that it couples to the channel at a different point in space such that the links will not have the same fading characteristics though to the receive antenna and spatial sum of the signals will be dominated by the stronger of the two signals. Or the transmitter signal design can be such that the combining at the single receiver can made in an optimal fashion as is done in Space-Time Coding Techniques . MIMO, Multiple-Input, Multiple-output systems de-multiplex the source data stream into multiple independent channel streams. This provides for both redundancy and channel capacity improvement . The MIMO technique is also referred to as Spatial Division Multiplexing, a single source data stream is multiplexed between two spatial streams. As shown in Figure 8, there are direct links and cross links between the two transmitters and two receivers. As a result, there are now there are four different communication channels that connect the two terminals and the characterization of the channel has a higher complexity. However, the signaling technique when combined with the properties of OFDM modulation can lead to an efficient channel estimation and equalization scheme. Shown below in Figure 9 is an illustration of the spatial multiplexing scheme where even signals are transmitted on TX0 and odd symbols are transmitted on TX1. The two receivers, RX0 and RX1 receive both of the transmitted streams through 4 possible channel transfer functions h00,h01,h10, and h11, which forms a channel matrix, [H]. 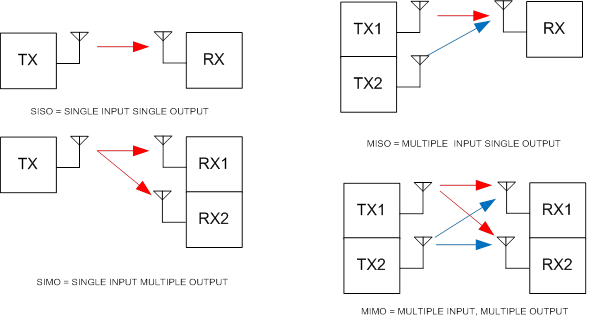 Figure 9: 2 X 2 MIMO as a spatial multiplexer. In order to equalize and extract the source symbol stream, an estimate of the channel matrix [H] must be made. This can be accomplished by transmitting both streams using a coordinated system of pilot subcarriers and null subcarriers as shown in Figure 10. Presented in Figure 11 is a representation of the received spectrum showing that relative levels of each subcarriers indicate relative levels between the direct and cross channel terms in the channel matrix [H]. 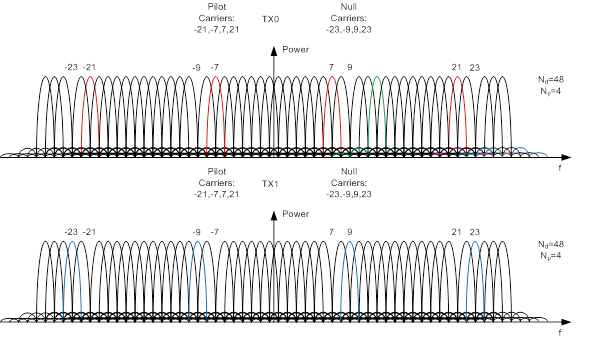 Figure 10: 2 X 2 Coordinated Pilot Subcarriers and Null Subcarriers at each transmitter. Figure 11: Received Spectrum at RX0 showing the relative levels of h00 and h10 from the pilot subcarrier levels. The spatial multiplexing technique associated with MIMO is another method to minimize the effects of a multipath communication channel through its redundancy and channel equalization properties. Diagram after: “MIMO Channel Modeling and Emulation Test Challenges,”K.Bertlin, Agilent Technologies, 2008. C. Oestges and B. Clerckx “MIMO Wireless Communications, “ Academic Press, 2007. B. Holter, “On the Capacity of the MIMO Channel- A Tutorial Introduction”, Norwegian University of Science and Technology, Department of Telecommunications, O.S.Bragstads plass 2B, N-7491 Trondheim, Norway.